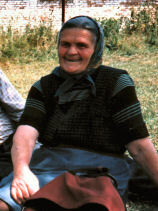 Dobrínka Spásova Kalpáčka was born on the 28th of November 1918 in the village of Raduíl, some 20 kilometers to the south-east of Sámokov. 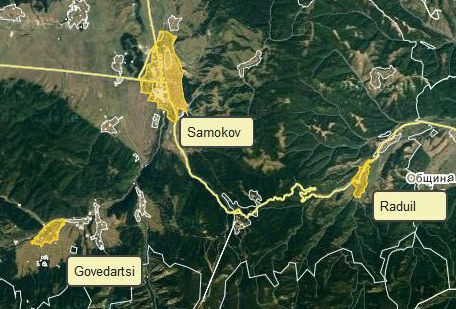 I met her on the afternoon of August 2, 1988, in Govedártsi, a village about the same distance from Sámokov but to the south-west. “Wow!” exclaimed her friend Elenka. “Oh, I’ve got Gypsy in me too,” affirmed Dobrinka. The thing that struck me at this point was Elenka’s reaction. Clearly the women were good friends—neighbors, as I later learned, and indeed close friends—but from everything I could tell (short of “breaking” the mood by intruding my own questions) Elenka was hearing this piece of information about her friend for the first time. She spoke almost with a sense of wonder, that Dobrinka had “Turkish ‘blood’” in her veins from being nursed as an infant by a Turkish gypsy. By this time my own mouth was hanging open. With such a story I would sooner have expected a hardened, embittered person—but the woman who sat with us on the grass seemed to be graced with one of the gentlest, most generous souls I have ever encountered, an impression which did not change as I saw her in later years, on other occasions. “Good Lord!” exclaims Elenka, and we both gasp. In 1989 I saw Dobrinka and her husband again, and she told me the story again. At the end of that conversation, I asked how the gypsy had recognized her? (I had secretly wondered if they might have seen each other occasionally as they grew up.) But both Dobrinka and Spas said definitively that it was a "completely chance" meeting, and he did not know or "recognize" her. It just turned out that way. I wish I had a picture of him too! For the die-hards who would like to hear this conversation, I'll put it here—but I don't really expect many people to listen to it! Later that afternoon, Elenka told Dobrinka how I had visited the village two summers before (with my husband and son) and had gone up into the field where a group of women were haying—another magical occasion. The women had sung, and we had recorded, and Elenka had recognized me from then, although she didn’t let on right away. Thanks very much, Martha, for sharing so many interesting and moving things with us. I'm eager to read and listen to more. Jutta from Germany (we met you in 2010 with Velka J. under the trees above the central stage of Koprivshitsa). I love this story! Life there is most likely the kind of life my own ancestors would have had in the old days in Europe. Your travels there have certainly given you a unique insight into life outside our little American bubble. Thank you for sharing!! Delightful story! Thanks for sharing!